Nature is a BOON. Practicing Naturopathy and Yoga is a Blessing. 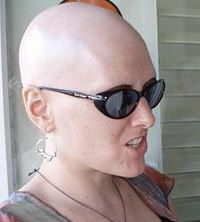 Alopecia is the medical term for baldness. 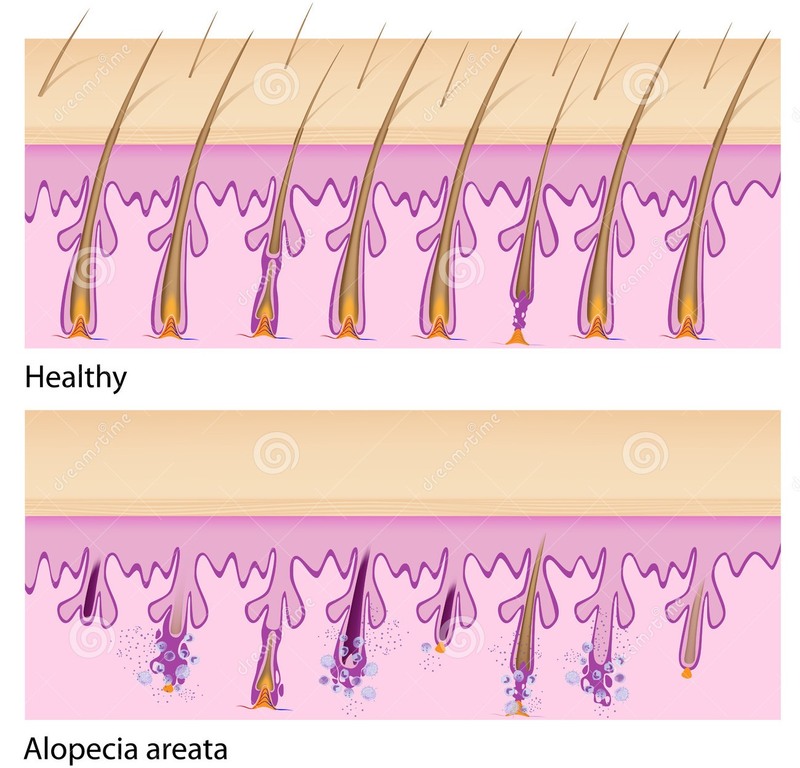 Alopecia areata is a type of hair loss that occurs when the human immune system will falsely identify the hair matrix as a foreign body and destroys it, leading to patchy hair loss in the region of attack. The damage to the follicle is usually not permanent. It is an autoimmune disease; that is, the person’s immune system attacks their own body. In this case, their hair follicles. 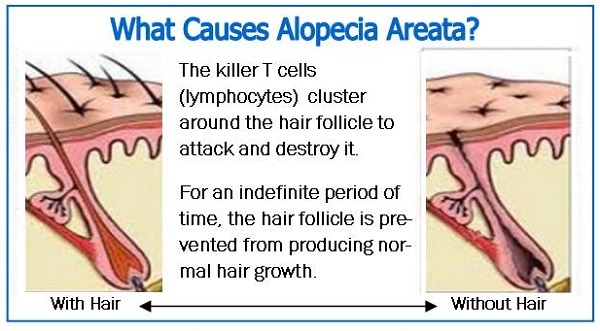 T cell lymphocytes cluster around affected follicles, causing inflammation and subsequent hair loss. The extent of the hair loss varies; in some, it is only in a few spots and in others, the hair loss can be greater. It is believed that the person’s genetic make up may trigger the autoimmune reaction of alopecia areata, along with other unknown triggers. What happens in alopecia areata? Alopecia areata usually begins when clumps of hair fall out, resulting in totally smooth, round hairless patches on the scalp. In some cases the hair may become thinner without noticeable patches of baldness, or it may grow and break off, leaving short stubs (called “exclamation point” hair). In rare cases, complete loss of scalp hair and body hair occurs. The hair loss often comes and goes—hair will grow back over several months in one area but will fall out in another area. 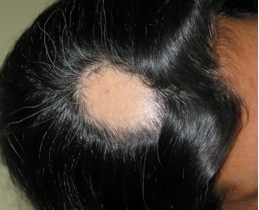 Typical first symptoms of AA are small bald patches. The underlying skin is unscarred and looks superficially normal. These patches can take many shapes, but are most usually round or oval. 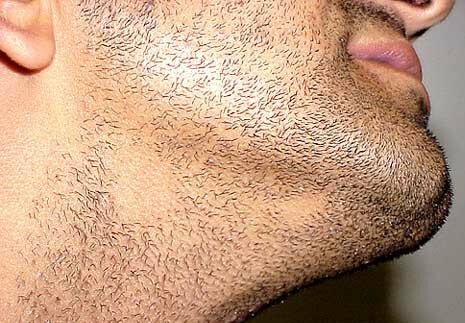 AA most often affects the scalp and beard, but may occur on any hair-bearing part of the body. 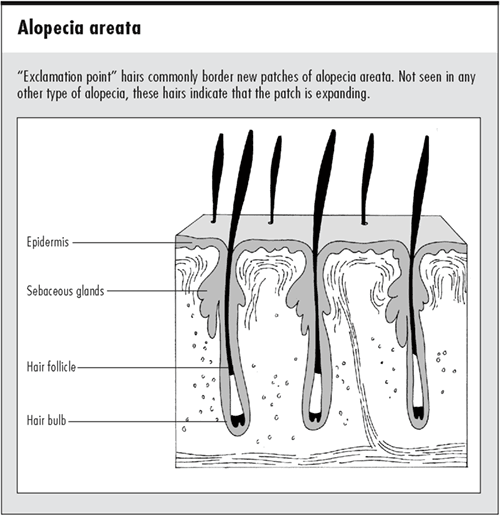 Commonly, alopecia areata involves hair loss in one or more round spots on the scalp. Hair may also be lost more diffusely over the whole scalp, in which case the condition is called diffuse alopecia areata. Alopecia areata monolocularis describes baldness in only one spot. It may occur anywhere on the head. 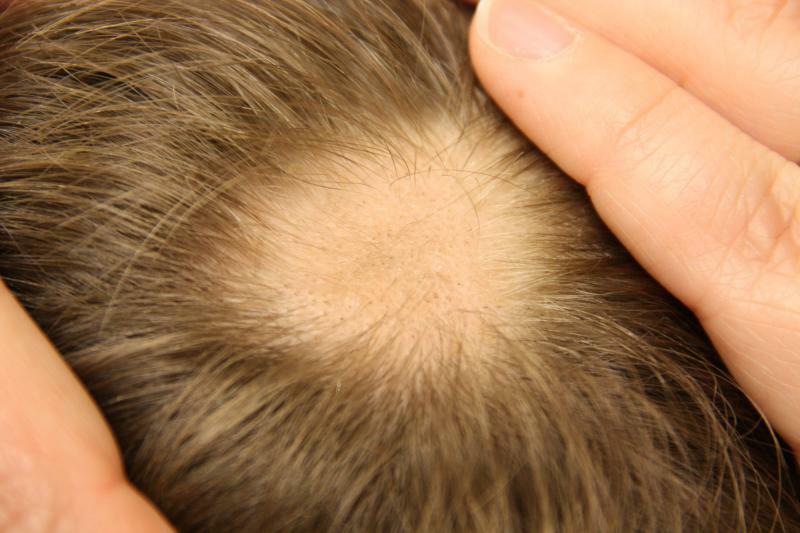 Alopecia areata multilocularis refers to multiple areas of hair loss. 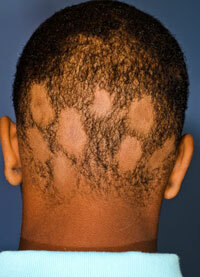 Ophiasis refers to hair loss in the shape of a wave at the circumference of the head. The disease may be limited only to the beard, in which case it is called alopecia areata barbae. If the patient loses all the hair on the scalp, the disease is then called alopecia totalis. If all body hair, including pubic hair, is lost, the diagnosis then becomes alopecia universalis. Alopecia areata totalis and universalis are rare. Alopecia areata is diagnosed through a medical history and physical examination. The doctor will ask questions about the hair loss, look at the pattern of hair loss, and examine the scalp. And he or she may tug gently on a few hairs or pull some out. Anyone can develop alopecia areata; however, chances of having alopecia areata are slightly greater if you have family history with the disease. In addition, alopecia areata occurs more often among people who have family members with other autoimmune disorders such as diabetes, lupus, or thyroid disease. 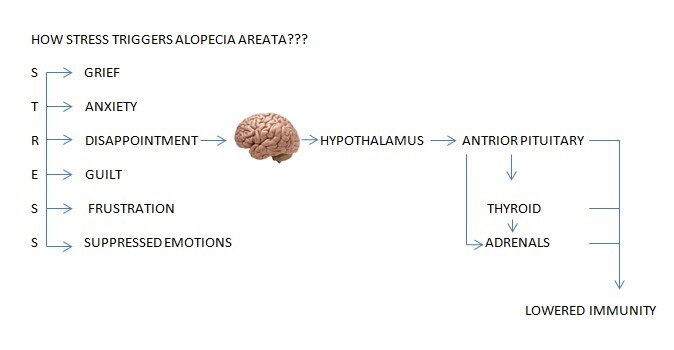 How stress triggers Alopecia Areata??? Alopecia areata does not affect you as another condition might: it is not painful, it does not make you feel sick, and it does not result in serious health problems. You cannot spread it to other people, and it should not interfere with school, work, or recreation. But if hair loss is making to feel unattractive, it is important to talk to someone about it. Alopecia areata cannot be totally cured; however, it can be treated and hair can grow back. While the disease is not medically serious, it can impact people psychologically. Support groups are available to help people with alopecia areata deal with the psychological effects of the condition. Alopecia can certainly be the cause of psychological stress. Because hair loss can lead to significant appearance changes, individuals may experience social phobia, anxiety, and depression. Skin, hair and nails are chemically related. Basic requirements for the health of these structures include adequate intakes of nutrients such as protein, essential fatty acids, minerals and vitamins. Biotin is an essential vitamin which has been found in clinical trials to strengthen soft brittle nails and reduce breaking and splitting after 12 weeks. Silica is concentrated in the nails, hair and skin and contributes to collagen formation to help it to strengthen. Improve Kidney function, thereby improve circulation and energy to the hair shaft to stimulate growth. A multivitamin supplement may be of assistance to ensure that you are consuming adequate amounts of nutrients needed to build new hair and strengthen the quality of the hair. Zinc helps maintain the structural integrity of the nails, hair and skin and is important for a healthy immune system. Vitamin C is important in the production of collagen and for a healthy immune system. Folic acid, iron, manganese, Silica, beta-carotene and vitamin B5 all assist with metabolism of nutrients important for nails, hair and skin. The herb Ginkgo may help to stimulate circulation to the hair shaft. Protein is an important food group which contributes to the overall health and quality of the hair. For healthy hair and scalp choose a diet rich in fresh fruit and vegetables, especially leafy green vegetables, and suggest you eat some good protein sources everyday. It is important to have a balanced diet to ensure your hair receives sufficient nutrients to stay strong and healthy. It is also recommend to use gentle hair products that protect the hair shaft and keep it supple. It is recommended that you avoid shampoos, conditioners and hair products which use Sodium Lauryl Sulphate.